I thought it might be helpful to keep a running list of links for the latest blog posts at Bilingual Monkeys. When a new blog post appears there, I'll also add the link here! Here's a reading worksheet with a humorous twist for engaging children and language learners. "Bilingual Earth: Secrets of Success from Parents of Bilingual and Multilingual Children Around the World" will be available in late 2020. Your influence over your children's minority language side is strongest during their younger years. Make the most of this time. My kids took the EIKEN test in Hiroshima the other day, the first time their English ability has been formally assessed. These are things I advise you *not* to say to your children in your desire to get them speaking the minority language more. Join me on my adventures in China (through 32 photos) during my week in Beijing to attend a friend's wedding! Beatrice Beckmann is the mother of two and the founder of KinderBooks, a service in the U.S. that provides access to German picture books and chapter books. Remember the "5 P's" for success at raising bilingual or multilingual children. 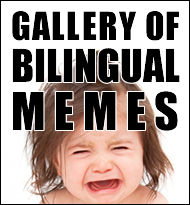 What were some of the most popular posts at Bilingual Monkeys in 2018? This list provides the links. This update on my son is an insider's look at his language development, just a few months before he enters junior high. This update on my daughter offers a behind-the-scenes peek into the successes and struggles of a bilingual teen. We took a memorable trip with my wife's parents--my children's Japanese grandparents--to the lovely old castle town called Hagi. These are the early board books that I read most often to my kids when they were babies and toddlers. Victor Santos is the father of two and the founder of Linguacious, a maker of language-learning resources in multiple languages. How can you strengthen your living space to help fuel your daily efforts and your children's language development? Ana Cristina Gluck is the mother of two and the founder of ABC Multicultural, a publisher of children's books in many languages. Feeling Discouraged About Raising Bilingual Children? Watch This Video. If you're feeling discouraged or frustrated about raising bilingual or multilingual kids, this fresh, empowering perspective can help. My father, Al Beck, has passed away. He died at 11:15 p.m. on May 16, 2018. Adam Beck describes important research on success rates for raising bilingual children and explains the implications of this research for parents. This new series at Bilingual Monkeys, with profiles of interesting bilingual lives, starts off by featuring the life and work of Delia Berlin. 7 Interviews with Adam Beck, Author of "Maximize Your Child's Bilingual Ability"
This post brings together seven interviews that I’ve given about raising bilingual and multilingual children through podcasts and video. My mother, Katrine Aho, has passed away. She died at 7:54 p.m. on March 26. 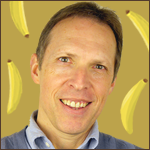 Raising a Bilingual Child, a New Podcast Episode with Adam Beck, Author of "Maximize Your Child's Bilingual Ability"
Interview on raising bilingual children with Adam Beck, the founder of Bilingual Monkeys and The Bilingual Zoo. How can you strengthen your children's engagement in the target language with other speakers of that language? The "Betty & Cat" books are an inspired approach to bilingual picture books with the story told through code-switching, not translation. In this encouraging guest post, Matthew John Thoren describes the proactive efforts that have produced happy success through the important early years of his bilingual journey. Download a free PDF to read the first 11 pages of How I Lost My Ear, a rollicking adventure for all ages. How I Lost My Ear is the captivating new novel from author Adam Beck and illustrator Simon Farrow, a humorous, high-spirited adventure for all ages. My Bilingual Daughter Is 13. My Bilingual Son is 10. So Why Is Their Level in the Minority Language Basically the Same? How is it that my children now have basically the same level of ability in the minority language, despite the gap of three years between them? 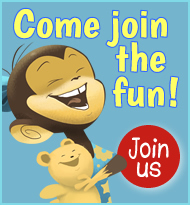 Did you see all these popular posts from this year at Bilingual Monkeys? Have questions about raising bilingual and multilingual children? Get the answers you need from these sites and resources! Christmas Giveaway at Bilingual Monkeys! Win a Cute Charm with “Bilingual Powers” to Help Empower Your Family’s Journey! Enter this free giveaway by November 30 for a chance to win one of 5 cute, colorful charms that can help empower your bilingual journey! From Adam Beck, the founder of Bilingual Monkeys and The Bilingual Zoo, a book of ideas and inspiration that can help your family, and families you know, make the most of 2018 and beyond. My informant at the shadowy U.N. agency known as Bilingualism Research and Tracking Systems (BRATS) urged me to make public this top-secret information on a range of provocative—some would say, even potentially dangerous—research studies involving bilingual acquisition in the world’s children. Test your knowledge! Which of the 7,099 languages in the world have the most first-language speakers? Did you know that there are also plenty of things you DON'T need to raise bilingual kids? 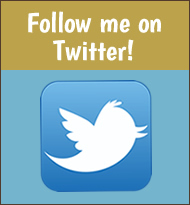 Don't miss this fun post on bilingual success, featuring lively animated GIFs. My kids and I have been studying Spanish for two years, but want to make better progress. Can you help us? Bilingual Adventures, the publishing imprint behind "Maximize Your Child's Bilingual Ability," is now inviting offers for the foreign language rights to this book. This short film, improvised by my son and me, is a lively example of a short-term project that can promote language exposure. There are two kinds of daily habits and these habits gradually lead, over time, to two kinds of longer-term outcomes: satisfying outcomes and dissatisfying outcomes. Which posts at Bilingual Monkeys have generated the most comments? How about some special names for sports teams made up of bilingual or multilingual kids? Can you mix the basic formula for empowering success at raising bilingual or multilingual children? The home environment should be mindfully, proactively shaped (and reshaped), on an ongoing basis, to effectively support our bilingual aim. Make the most effective choices and decisions you can, for your bilingual journey and for your life as a whole. There are many things to love about bilingual (and multilingual) children. This short video shares 20 of them. Watch this short video for a motivating perspective on the entire bilingual journey! Freelance journalist Jordana Timerman shares the insightful and encouraging story of her first two years raising a bilingual child. These resources can nurture a child's global spirit and empathy for others--and help make this world a more peaceful place. Here's a special peek at the growth of my children's ability in the minority language over the years. Watch this fun video of my original tongue twisters, featuring my cousin Andy! Having some difficulty getting your child to speak your language? Watch this video for clear, actionable advice. Here's a two-step process for handling the difficulties and frustrations of the bilingual journey. These playful ideas can provide engaging, effective language input while nurturing a positive attitude toward the target language. Raising Bilingual Kids? Don't Miss These Helpful Resources! This post is a handy guide to the wide range of resources now offered by Adam Beck--many of them completely free--for parents raising bilingual or multilingual children. Here's a wonderful example of the positive impact "Maximize Your Child's Bilingual Ability" is having on families around the world. I've sustained my efforts for 4380 days (the first 12 years of childhood). What comes next in the teenage years? Our time with grandparents--like blooming cherry blossoms--is precious and fleeting. Are you making the most of it? In this thoughtful guest post, Bea Sieradzka offers an encouraging look at the language strategy she pursued during her son's early years. My daughter graduated from elementary school the other day, a major milestone in her life and in our bilingual journey. 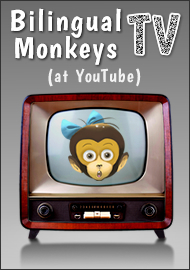 Watch this video series on Bilingual Monkeys TV at YouTube. Trilingual speech-language pathologist Ana Paula Mumy offers another insightful guest post, from her personal perspective as a parent. Are you adequately addressing the two "core conditions" for success in your efforts to raise a bilingual child? Gabriela Simmons marks World Read Aloud Day with a lively guest post that stresses the importance of reading aloud and shares useful ideas for this practice. In this encouraging guest post, Amy González explains how she proactively "kicked out" the majority language from her home. This playful idea can help promote motivation in children and engagement in the target language. This article about my work appeared in the latest print issue of GetHiroshima Magazine. What creative tactic did I use to motivate my daughter when she was reluctant to open our dictionary? What's next for Bilingual Monkeys in 2017? Find out in this first post of the new year! Which posts made at Bilingual Monkeys this year were the most popular? Are you making active use of "imaginary talk" in your interactions with your kids, to promote greater exposure to the minority language? Adam Beck and Amanda Hsiung Blodgett discuss a range of key issues related to raising bilingual kids in this nearly hour-long video. This video had me laughing a lot, until the very end...when it moved me so deeply, it made me cry. Lil'ollo creates very appealing resources for families and schools on a bilingual or multilingual journey. Filipa Pinto describes her personal efforts as a parent and workshop leader of small children and offers useful suggestions for specific games and activities that are both fun and effective for language development. My friend touched my life one last time with this message. In this encouraging guest post, Keli Garcia Allen offers helpful advice for when you get sidetracked from your bilingual quest. Learn about a really fun and effective idea for writing practice, and read some example stories from my own family. Jonathan Fisher reflects on his first two years of bilingual parenting and traces the evolution of his thoughts and actions. The early response to Maximize Your Child's Bilingual Ability, from professionals in the field and parents around the world, has been extremely positive. Follow these 7 steps to strengthen your child's bilingual development and promote more active use of the minority language. Eliza Sarnacka-Mahoney stresses how raising bilingual children is an entire wide-ranging lifestyle. Eve Lindemuth Bodeux has written a very helpful book that offers a wealth of tips and tools for those seeking to strengthen an additional language. Is your "iceberg" forming as you hope? Chontelle Bonfiglio shares the touching story of her monolingual past, and the bilingual future she is determined to create for her own two kids. Guest Post: Want to Make and Sell a Language-Related Product? Here’s How I Did It! Una McCarthy-Fakhry, the founder of LoveYourLingo, shares her experience and expertise for budding entrepreneurs. Llacey Simmons, a monolingual parent, relates her early efforts to nurture her son's acquisition of a second language. Author Delia Berlin shares her thoughtful perspective on how bilingual books can be beneficial in homes and classrooms. Sam Zerin shares his personal struggles, as well as helpful suggestions, on the challenge of speaking the minority language in public. 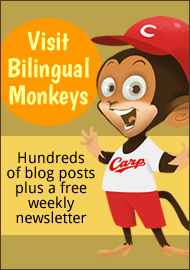 Want to write a guest post for Bilingual Monkeys? See this post for the full details! Annick De Houwer, a noted authority on child bilingualism, offers helpful thoughts to parents of bilingual kids. Make the most of a sick day by promoting input in the minority language. I've come to the final step of my longtime efforts using captive reading to promote the language and literacy development of my kids. Take This Quiz on Bilingual Acquisition in Children! How Many Will You Get Right? Another quiz on raising bilingual kids, this time based on the book Bilingual First Language Acquisition by Annick De Houwer. Annick De Houwer is the author of the books Bilingual First Language Acquisition and An Introduction to Bilingual Development. I asked my children to make a list: "7 Things I Like About Daddy." What are the building blocks for promoting strong language development in our children? How Far Into the Future Do Your Efforts Today Matter? In this guest post, Christine Gilbert shares the bilingual development of her English-speaking children as they learn Spanish in Mexican schools. Raising a Bilingual Child? Raise the Odds of Success for Your Family! What are the odds of bilingual success for your situation? How can you improve those odds? Ask and address these important questions to strengthen your efforts and your success at raising bilingual children. The Bilingual Zoo has become a very lively forum for parents of bilingual children around the world. Short-term projects--like this little movie I created with my kids--can be a productive way of enhancing exposure to the minority language. Beautiful, fleeting cherry blossoms are a strong reminder to appreciate and make the most of our days as parents of bilingual kids. Want Stronger Success at Raising Bilingual Children? Repeat After Me: Shannon Shorter! A penchant for language play is hugely rewarding, making your efforts to nurture the target language more productive and more enjoyable. What if you've done your "very best" but you're still "failing" at your bilingual aim? "Think Bilingual" is a unique new app that provides an immersion experience for language learning through a playful, game-like design. To raise a bilingual child, the important thing isn't perfection, it's perseverance. Get informed and inspired by listening to the podcasts Bilingual Kids Rock and Bilingual Avenue. A virtual experience of my regular morning walk and my reflections on the bilingual journey. Making regular use of "imaginary talk" is a key tactic for promoting a child's language development as well as a playful parent-child bond. In this blogging carnival for Valentine's Day, a variety of bloggers share the things they love about bilingual children. In this guest post, Jonathan “Fish” Fisher recounts a trip to the U.S. and its impact on his son's language development. How should parents of bilingual kids make use of digital devices to effectively nurture the minority language? A wonderful project, pursued by a family in the U.S., that brought them closer to the world and boosted their bilingual aim. Important resolutions for making productive efforts this year, and every year. What happens when Santa tells a little girl that she won't be getting a Wii video game console for Christmas? For all language lovers, teachers, and learners, enjoy this big list of quotes on the marvelous phenomenon of human language! Parents of Bilingual Kids, Take Time to Relax and Recharge Your Energy! Raising bilingual children demands persistent effort, but the foundation for this effort is our own good physical and mental well-being. From the horror of Hiroshima to the terror of Paris, the world is mad. Why does raising bilingual kids even matter? A Fish in Foreign Waters, by Laura Caputo-Wickham, is a picture book that can help promote a positive attitude in bilingual kids. Human beings aren’t the only ones that benefit from bilingual ability. I sat down with 10 monsters for exclusive interviews on their experience of being bilingual or feeding on bilinguals. In this guest post, Michele Cherie shares a trip to France which had a powerful impact on her children's growing ability in French. What activities can parents pursue in the car to promote use of the target language and stretch language development? Make History. Raise a Bilingual Child. A visit to the old silver mining town of Iwami Ginzan reveals how parents raising bilingual kids can make history. How Do You Spell B.I.L.I.N.G.U.A.L.? Ana Paula Mumy, a trilingual speech-language pathologist, shares helpful strategies for promoting a bilingual child's use of the minority language. What are the biggest regrets of parents who have struggled to raise bilingual children? What is a "home run book" and how is it important to the goal of raising a bilingual child? How can the parents of bilingual kids create stronger ties with distant grandparents and other family members? What are the three essential steps to the process of raising a bilingual child? Tongue twisters are a fun and effective way to promote a child's language development. The more of these actions you pursue, the more you will raise the odds of achieving the aim of your bilingual journey. It’s true. My son called me a butthead and I couldn’t be happier. Instant Inspiration for Parents Raising Bilingual Kids is designed to empower your daily efforts and long-term success. Download it now. My friend was shocked at the message his daughter had written to him. In fact, I think this will make an important difference to his whole bilingual journey. Speech-language pathologist Ana Paula Mumy has written a masterful guest post on language acquisition and language delays. Resources in the minority language are the wood needed to fuel the fire of bilingual development. The Ultimate Crossword Puzzle About Raising Bilingual Kids! Try this cool crossword puzzle, created by Adam Beck, the founder of Bilingual Monkeys and The Bilingual Zoo. What can a conceptual artist teach us about the challenge of raising bilingual children? The first “direct evidence of effects on the brain” adds weight to the importance of reading aloud in the minority language to bilingual children. A new infographic, for bilinguals and parents of bilingual children, on bilingualism and its myths. Family Language Learning: Learn Another Language, Raise Bilingual Children, by Christine Jernigan, is a valuable book for non-native parents. Could this "crazy secret" help maximize your children's bilingual ability? Engage your bilingual children in the use of their minority language with a playful interview! When all is said and done, this could be the greatest benefit of the bilingual journey. You mustn’t read this blog post! It’s much too dangerous! It contains dreadful secrets you don’t want to know! The bilingual journey is thousands of steps, uphill, but they only need to be taken one at a time. To get your bilingual children using their minority language, turn to activities featuring animals. Three short fables, in the spirit of Aesop, on the theme of raising bilingual children. What simple action, made into a regular habit, can have a powerful impact on your daily efforts and your children's bilingual development? Four stories from one week in my bilingual journey, to offer insight into my struggles and successes, and inspiration for your own efforts. A fun infographic for Valentine's Day (and every day)! For families seeking to support the Spanish side of their children, Nathalia's bilingual music is ideal for bright, bouncy language exposure. Thoughts for reflection, in the spirit of Zen. Maximize your children's engagement in the minority language by matching their madness for play. How can you kindle more motivation in your children for the tasks you give them? 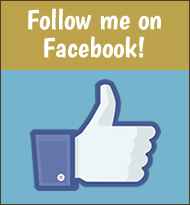 Learn what my resolutions are for 2015 and how I can lend support to your own aims for this year. Big Breakthrough with My Bilingual Daughter? I finally found some books that seem to have made my bilingual daughter a more eager reader in the minority language. What surprising thing does this baby want for Christmas? Hear my kids singing (and screaming) this updated Christmas carol! Most people know only the professional side of François Grosjean, the noted authority on bilingualism. This post reveals his remarkable personal story. Eugene Ryan, a university teacher and researcher studying bilingualism and children with Autism Spectrum Disorder (ASD), continues his personal story. "Bringing up a Bilingual Child," by Rita Rosenback, is a sensible, strategic guide for new parents wishing to raise a bilingual child. The bilingual journey can bring many benefits to children and their families, but sacrifices must be made in order to reap them. Ryan Cole has created an app that not only enables parents to note their children’s first words, it even translates these words into other languages so loved ones can comprehend them, too. What important zombie traits should parents adopt in their efforts to raise children with good bilingual ability? In this guest post, Mayken Brünings shares a trip to Germany which gave a boost to the German side of her daughter's bilingual ability. A daily homework routine is central to my efforts at home. In this follow-up post, I share the strategies and resources of our current routine. In this guest post, Peter Martin recounts a trip to Ireland with his family that advanced his children's language ability and cultural awareness. Can bilingual children play a special role in making the world a more peaceful place? Lately, I’ve heard from several parents with the same concern: they feel that they’ve “failed” at their goal of raising a bilingual child. When I visited my children's school for "parents' day," I realized something important about their bilingual development. In this guest post, Nellie Robertson recounts a trip to Hungary with her children that gave a big boost to their minority language. I Do Not Teach Children. I Give Them Joy. The most effective way to promote learning involves inspiring joy in the child's experience of that area of knowledge or skill. Another Fun Quiz on Bilingualism! Test Your Knowledge! Try this quiz on bilingualism, with questions based on information in Colin Baker's book "A Parents' and Teachers' Guide to Bilingualism." "A Parents’ and Teachers’ Guide to Bilingualism" is a comprehensive and authoritative book that can serve as a core reference for homes and schools. Even your failures are successes, in a way, when they're experienced in the minority language. Time is the very fabric of our lives, and the way we perceive time, and use (or misuse) time, is at the heart of our bilingual journey.